It’s officially warmed up here and I am breaking out all of my favorite sundresses and sandals! I love a good trendy piece or accessory, especially when it doesn’t break the bank, but there are a few pieces I am willing to splurge on that I know I will wear from summer to summer. A neutral pair of sandals, a classic clutch and a great pair of sunnies are things I am willing to spend a little more on because I know I will wear them again and again! A white clutch is a summer must! It goes with everything and is perfect for summer night’s out or when attending a wedding. I was sold the minute I saw this Kate Spade perforated option. The cutout detailing adds a unique touch but it’s perfect size makes this cutie a summer classic to be styled from year to year! Every few years I invest in a pair of neutral sandals. Something comfortable and cute that I can take from work to running errands on the weekend. This option has been on my wishlist for quite some time and I finally decided to purchase them this year. I have already worn them so much and can’t believe how comfortable they are! They are also perfect for summer travel! If you’ve been eyeing these, you should definitely pick up a pair. They are worth the splurge and I promise you won’t regret it! A great pair of sunnies is something you will wear year round. I’ve had these for a few years now and they continue to be my most worn pair. The classic shape and color make these an investment that you will wear year after year! 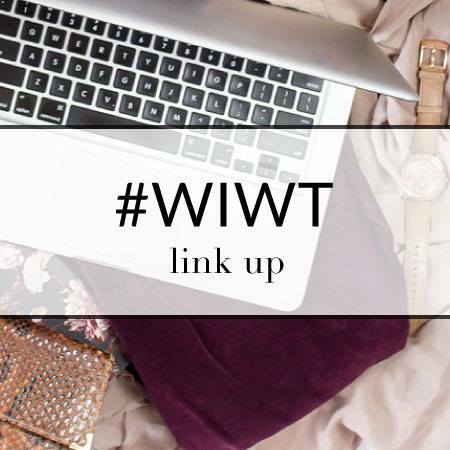 Tory Burch and Karen Walker all in one place! Happy Shopping! Next Post Floral Halter Romper & a Giveaway! That is such a beautiful embroidered off the shoulder dress! Perfect for summer with those sandals, and I really like your little white clutch too. That dress is amazing! Love the clutch too! I'm in love with your embroidered dress, and what a beautiful clutch! Such a pretty summer look. This dress the whole look is just perfection for spring and summer. All the details in this look are so perfect! Love it! I really like the off-the-shoulder trend, but I've yet to find a dress that has proper tailoring to go with the design! I am obsessed with that embroidered off the shoulder dress. It is so beautiful and summery. I also like to splurge on pieces I will wear for several years or seasons. A nice bag, a great pair of shoes and a wear everywhere jacket are a few of the key pieces that are worth splurging on to me. Such a gorgeous dress and love the color and embroidery on it. I love the bag too. I haven't invested much this year in summer accessories but I did buy a few sunglasses and a sun hat that I'm loving. I totally agree with the splurges. Especially the sandals. Having one pair that can be worn with everything is so important! I would love a pair of expensive shades, but my girls are still little and love to wear them so I have to hold off on spending the moola on those. Hope you have a great weekend! I also LOVE LOVE LOVE that dress! You are basically wearing my dream outfit! I have been swooning over that dress in blue! LOVE the colors! I love these pretty sleeves! That clutch is perfect for summer. 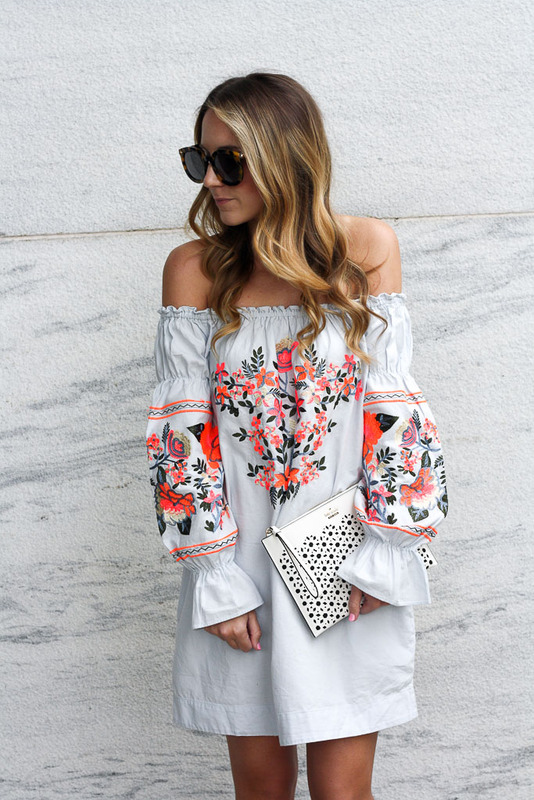 I am obsessed with everything embroidered and off the shoulder so this is fantastic! Ooh love this dress so much! Absolutely obsessed with that dress on you! I have been loving embroidery. That dress is so cute! I love the embroidery and off the shoulder style! Totally with ya! Somethings are worth the extra money for sure! Love the embroidery on that dress! That dress has the prettiest detailing! So cute! Obsessed with this dress, Nordstrom is my fav! I love everything about this outfit and I agree about Nordstroms. They are the best! wow that dress is so gorgeous and you look amazing!! I never thought I would use a clutch over a purse with shoulder straps but I really really love yours!! Shoes, bags and sunglasses are one of the few things I splurge on as well! Because I use them so much and for season after season if I pick timeless pieces, I don't mind paying a little extra for them. totally obsessed with this dress on you! I also love splurging on nice sunglasses for summer! This dress is gorgeous on you! And such a cute clutch! I love your dress, so breezy and comfy, and the embroidery really makes it pop! Nuetral sandals are the best in the summer. I like them to go with EVERYTHING…Sometimes I buy more than one! That dress is crazzzzy good! Absolutely love the ots and the embroidery!! Such a great dress on you! such a pretty dress, love the floral print! Love this dress girl! I definitely agree that you can splurge on a good pair of neutral sandals! Such a gorgeous look! I love how the white clutch pops against your dress 🙂 Nordstrom is my favorite for everything, but especially splurge purchases! I love to splurge on accessories, too! IN fact, I just got those exact TB sandals and love them! Also, how cute is your dress?! I need your entire outfit! So perfect for summer! this dress is so fun for summer! You look so gorgeous in this dress! The color and detailing are so pretty and perfect for summer. Love those sunnies too! Nordstrom always has the best outfits and closet staples for every season! Super in love with the embroidery of the dress! I am so obsessed with your dress! So cute! Love the detailing on this dress! I always think embroidered items look so expensive and Lux! Girl, I am LOVING this dress on you! The embroidery detail is perfection! Love your dress!!! SO cute!! I love this embroidered dress! I splurge on items only if I am really in love with them or if they are great quality. That dress look sos cute on you, I love the embroidery!